Create a warm and welcoming look for your guests with this contemporary style end table. 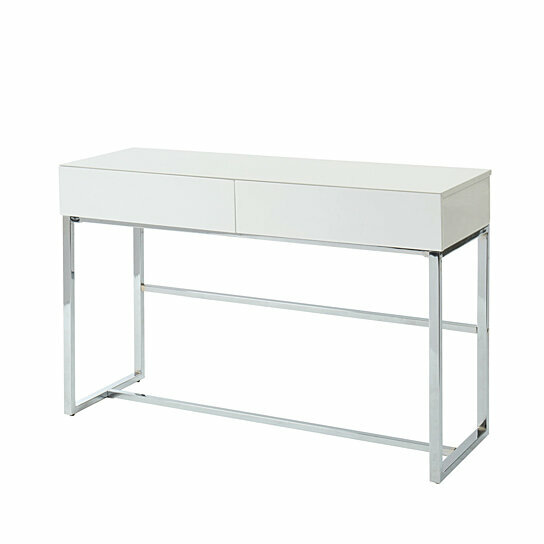 It has minimalist design by using wooden top and metal feet in rich chrome finish. This coffee table a perfect addition to any decor. The table can be place in the living room or in the hallway and use for placing vases, photo frames, small decorative items, books etc. It also consists two drawer compartment for you to stash away small things easily. Its metal base gives sturdiness to the frame. Bring this sofa table home to create a serene retreat and to turn your home interior into classic finish.